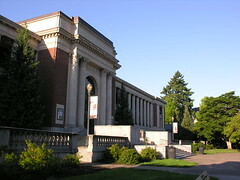 Oregon State University is a great example of a northwestern campus – a cross between imposing Greek-style buildings and some modern facilities. With almost 22,000 students in over 200-plus different disciplines in undergraduate and graduate programs, OSU is training a lot of minds! Majors range from forestry – a natural with those tall pines – to oceanic and atmospheric sciences as well as education, business, agricultural sciences, veterinary medicines and more. The environs around the campus have some heavy-hitters in the technology world as the Hewlett-Packard campus is nearby as well as other large companies. And, then there are the extracurricular experiences – may I interject – Go Beavs! The OSU football team (Pac-10) is known as the Beavers, conjuring up kindly, but intrepid creatures, gnawing away at the opposition. When we last looked, their season was at 7-3, so they are winners! 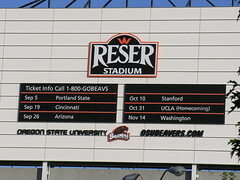 Reser Stadium is just across the street from the Hilton Garden Inn where we were staying, but the campus was very, very empty, so we didn’t see ANY students. That felt strange. We passed by Reser Stadium, the athletic center and the student union, but they were locked tight. But, trust us, it was a great campus that honors both the modern and classic traditions. 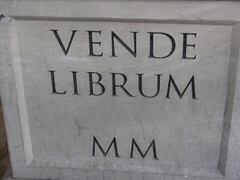 We were also eager to see their “award-winning” library, but it, also, was closed. Visiting a campus during intersession has mixed blessings. Getting around was easy, but we didn’t get the full flavor of what the campus and Corvallis are like with the thousands of students in session. Another campus we wandered onto in Corvallis does – apparently – top secret agricultural research. We were just looking for the covered bridge shown on the map. 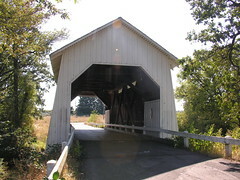 (See Irish Bend Covered Bridge below.) We were told that we weren’t supposed to be on this campus in the western part of the City, but lots of others were riding bikes in the vicinity. Be aware that a road shown on the map as a through road, isn’t. We took pictures quickly and headed back the way we came. 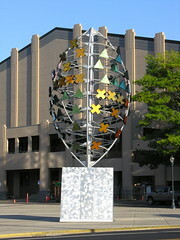 We had originally planned to stay in Corvallis for only one day, but decided to stay two and arrived a day early. We’re so glad we did! 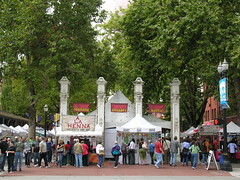 Portland’s Saturday Market is misnamed – it is also open on Sunday. Unlike most craft fairs that come and go, the Portland Saturday Market is open from the end of February through December 24. We admit it. We love books. Probably the most exciting place for a person who loves books is Powell’s City of Books. “City of Books” sounds like an exaggeration, but by the time you explore the main location, with its multiple floors and many nooks and crannies, you feel like it could be a city. At Powell's entrance - "sell books"
Last Friday we went Old School in Portland to McMenamins Kennedy School, now it’s time to go Rogue! After a two and a half hour drive over the Cascade Mountains on a road (U.S. 20) that wouldn’t win any awards for staying in a straight line, I arrived in Corvallis, Oregon. Most people will probably say, WHERE?